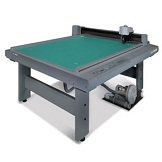 The CF2 Series flat bed cutting plotter is capable of cutting various kinds of media with high accuracy without a frame. These machine are available in 3 sizes with several head combinations. You select the one best suited to your media needs. The CF2-TDS machines come standard with an electric eye Sensor for cutting "Registered" samples. With the adoption of a high performance color photo sensor, square register marks which are printed on the media are read by the machine. This allows the position of the origin, inclination of coordinate and distance to be corrected. This allows you to cut perfectly registered samples. A Non-Sensor model is also available as a special order. The TD models come with 2 different creasing wheels, 200 High Speed cutting blades, 3 Carbide cutting blades, and a Swivel cutter and 3 blades for adding partial cuts and glue assist perf to your samples. Please call our sales team for more information and availability. The RC machines can cut in 2 modes. Regular Drag Cutting and Variable Speed Recipocating Cutting. They are capable of cutting materials up to .800 in thickness. The RC models come with 2 different creasing tools, 200 High Speed cutting blades, 3 Carbide cutting blades, and 5 Recipocating Blades.